Import Tuner Challenge is the international title for Shutokō Battle X (or Shutokou Battle X) (首都高バトル X), a racing game published by Ubisoft and developed by Genki for the Xbox 360. It is the final main installment in the decade running Shutokō Battle series of games known as Tokyo Xtreme Racer in North America and Tokyo Highway Challenge in Europe, and was the last Genki-developed video game. Despite being the last Shutokou Battle game, this is the only Shutokou Battle game to be on the Microsoft console. After the 13 Devils have been defeated once more in the Kaido Circuit, Motoya Iwasaki, aka Speed King, disappeared suddenly, leaving without a trace. Since then, many drivers from all the Japan come to Tokyo in order to have his title of "Speed King". The hero here is the best friend of Iwasaki and beats Bloodhound, Midnight Cinderlla, Platinium Prince, Skull Bullet's gang & eventually, the Phantom 9. In the meantime, Bloodhound reveals to the racer why Iwasaki has been depressed for a long time : his girlfriend died because she was ill and Iwasaki wasn't there to support her. Since then, he hate himself for considering that racing was more important than his girlfriend. This explains why he was easily cajoled by Hamagaki during the events of Kaido Battle : Touge No Densetsu. But after the racer beats the Phantom 9, Iwasaki challenged him only to be defeated by his friend. It seems he died against the last rival in his dark blue Fairlady Z S30 : ?? ?, for a tire screech is heard from the highway. The player's objective in the game is to make a name of the player out on the highways of Tokyo. The player begins as an unknown driver and as the player progresses through the game by earning increasingly impressive nicknames or Handles as they're called in the game. The player begins the game with a small amount of currency before picking out the first car. When the player picks the first car, the player will begin a race against Iwasaki in the Nissan Skyline 350GT Coupe. After the player finishes the first race, the player will go out on the highways at the selected given day of time. The player will begin a race by flashing the high beams behind an opponent. Both the player and all opponents are given spirit point bars. These bars are depleted by being significantly behind the leader or by being involved with collisions. When a spirit point bar is completely drained, the spirit point bar's associated driver is forced to retire from the race. The player's victory will earn money which the player can use to upgrade the cars or to purchase new cars as well. Another feature of the game is the parking areas. A parking area is the place where the player can get more information about the other racers and the crews and to challenge some opponents. The player can challenge some opponents to a time attack battle which is essentially a traditional race where racers must follow a predetermined route to a specified finish line without any of the racers having to worry about any spirit point bars, three-way SP battles, four-way SP battles or one-on-one SP battles. The player can also challenge other opponents to spirit point battles as well. While Famitsu received the Japanese version very well, it did not receive well overseas. GameRankings gave it a score of 52.77%, while Metacritic gave it 54 out of 100. TeamXbox's Nate Ahearn rated the game 4.9 out of 10, saying, "Tuning the numerous parts of your car provides for some decent variation, but you’ll soon figure out that the actual gameplay just isn't very good." IGN's Erik Brudvig criticized the AI for being too easy, saying, "They can be blown away on every turn with only minimal drifting and turning skills." Many famous rivals in the game were featured in Wangan Midnight for PlayStation 3, such as Jintei/Speed King in his Impreza GDB, The Three Dragons in their Supra JZA80's, and White Charisma in his RX-7 FD3S. 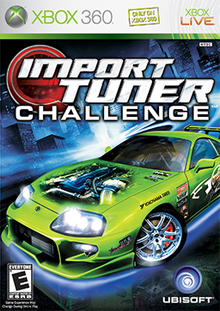 ^ a b "Import Tuner Challenge for Xbox 360". GameRankings. Retrieved March 15, 2010. ^ a b "Import Tuner Challenge for Xbox 360 Reviews". Metacritic. Retrieved December 4, 2014. ^ Sewart, Greg (October 7, 2006). "Import Tuner Challenge". 1UP.com. Retrieved August 16, 2015. ^ Gerstmann, Jeff (October 2, 2006). "Import Tuner Challenge Review". GameSpot. Retrieved December 4, 2014. ^ Lewis, Cameron (September 26, 2006). "Import Tuner Challenge review". GamesRadar. Retrieved December 4, 2014. ^ a b Brudvig, Erik (October 10, 2006). "Import Tuner Challenge Review". IGN. Retrieved December 4, 2014. ^ "Import Tuner Challenge". Official Xbox Magazine: 80. December 25, 2006. ^ a b Ahearn, Nate (October 26, 2006). "Import Tuner Challenge Review (Xbox 360)". TeamXbox. Archived from the original on December 9, 2010. Retrieved December 4, 2014. ^ Donaldson, Stan (February 18, 2007). "Fast times on the streets of Tokyo". Detroit Free Press. Retrieved December 4, 2014. This page was last edited on 18 February 2019, at 01:56 (UTC).